YAKINDU Model Viewer is a lightweight viewer for Simulink and Stateflow models. It loads and visualizes especially very large models up to 8x faster and has advanced functionality to improve your workflow. Understanding how signals are processed from inputs to outputs is especially useful when analyzing your Simulink model. The advanced signal tracing functionality of YAKINDU Model viewer provides everything you need. See the flow of signals at a glance in a dedicated view. 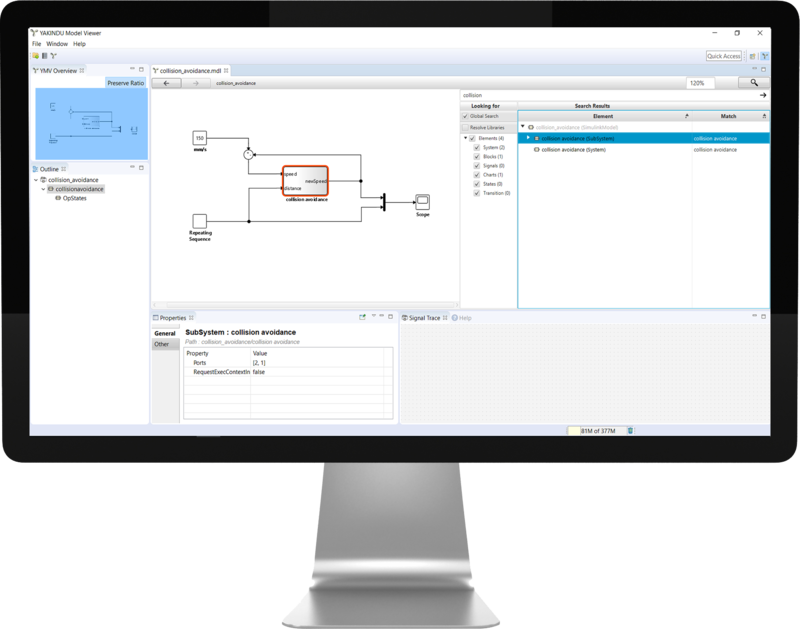 A lot of users working with Simulink models don’t need the high amount of features of the tool – they only need to explore models without any need to edit them. YAKINDU Model Viewer is extremely lightweight. It enables you to just visualize even large models – that contain several thousand diagrams – up to 8-times faster than Simulink does. Review and analyze your Simulink models even offline – without any expensive Matlab licenses. 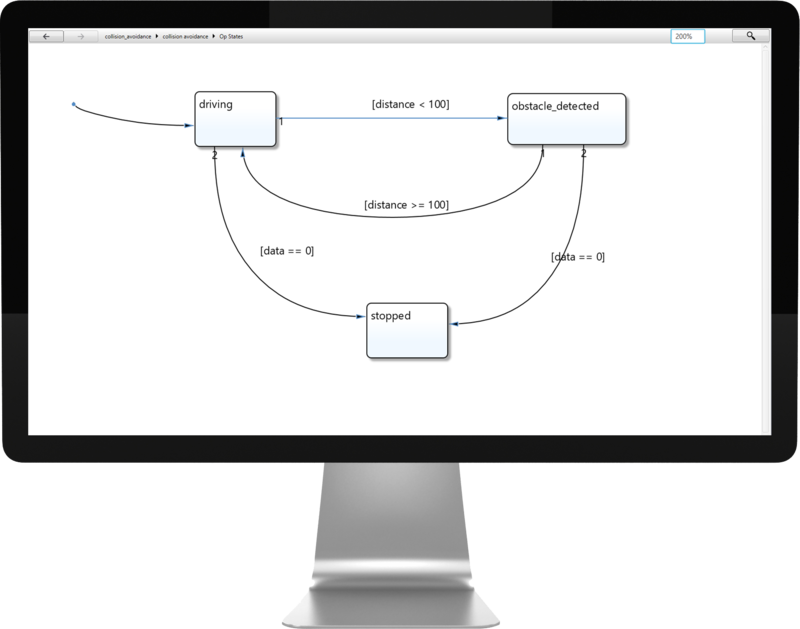 With YAKINDU Model Viewer you are able to navigate on and inspect diagrams with a fast drill down of the system hierarchy, e.g. with a simple double click. Breadcrumbs as well as the Outline view show the structure of the model and allow to navigate quickly to the location you are interested in. Finding specific blocks or parameters is essential when working with and analyzing large models. Thus, the search function of YAKINDU Model Viewer gives you the possibility to find and navigate to search results quickly. Create links and navigate between model elements and documents of different formats such as PDF, Microsoft Word and others to understand your models quickly. Bundle your models and the augmented documentation as Model Manuals and share them with your colleagues so that calibrators, testers and other roles can benefit from them. Traceability is a need for safety-critical systems. 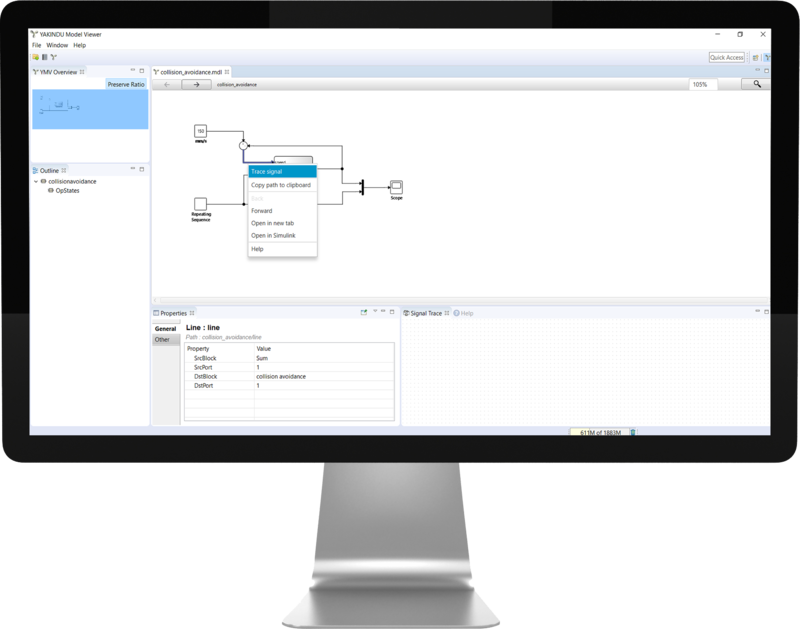 Link model elements such as blocks, signals, properties, states, and transitions to any relevant artifact like requirements, architectural elements, test specifications or else. Use the bidirectional trace links for navigation between tools and trace analysis.